Welcome to week #6 of our Herbal Medicine Chest. Join us every Monday for the next several weeks to explore herbal preparations and put together your own Herbal Medicine Chest. Share your favorite remedies with the linking tool at the end of each Monday's post. (Now closed to new entries) Don't forget to check the comments section of each week's post to read the remedies shared by savvy folks who aren't blogging. The Herbal Medicine Chest has it's own button! Grab it from the side bar to share on your site. See the Herbal Medicine Chest page (directly linked from the new button) to connect with all the articles in this series...even info pages that are not included in the hop, or visit the archives for direct links. If your looking for a way to apply herbal remedies without leaving the oily protective barrier on the skin that you desire with salves, ointments or balms, consider lotions, creams and hydrosols. These herbal preparations are also valuable in our cosmetic/personal care arsenal. Now you can grab a button to link up to the Herbal Medicine Chest page from your site. Each week's blog hop post is added to this page so you can find all the articles in one place. If you've been following my blog over the past several weeks, you know that I've been talking about creating your own Herbal Medicine Chest. The series will end in a few weeks and I'd like to begin offering hands on classes to help you put that knowledge into practice. Depending on your interests, this could be a two session class. Consider this a survey...Which classes pique your interest? Contact me privately by email or fb messages to let me know what you're interested in learning or for more details. Classes will involve a small fee to cover costs, etc. Each class will include at least 3 recipes, sample product to take with you to get you started, and some will offer more. What time works best for you? Evenings? Saturdays? Let me know so I can begin planning. I'd like to start in March if there are enough folks interested. See the Herbal Medicine Chest page to connect with the articles in this series that talk about creating those basic preparations. The following group of herbal preparations deliver our remedies in some very flavorful ways. Syrups and Honeys - are the epitome of "a spoonful of sugar helps the medicine go down" with their thick, sweet flavor, not only pleasing to taste but also coating and soothing. A syrup might be a good choice for delivering an herbal remedy because children are more willing to take it, or because the sweetness masks the strong flavor of herbs like horehound (Yikes!) or because we need the remedy to go down more slowly, coating the throat or the esophagus and sphincter with their soothing, healing goodness. Maybe a combination of the three! Or you can add them to a cup of tea to sweeten, flavor and add healing benefits in a mild tasting, warm, soothing medium. Method #1 - In a saucepan, combine equal parts prepared herbal infusion or decoction and unrefined sugar or honey. Heat. Stir until dissolved. Store in dark glass bottles with cork stoppers. This is important because a little fermentation may take place and the expansion may cause the bottle to burst if capped tightly. Method #2 - Herbal honey or syrup- A slower extraction method that involves packing a jar with fresh herbs. Cover the herbs with honey and let sit for 3 weeks. Strain out the marc and cap. Because there is no water involved in this method and honey is such a good preservative, mold and fermentation are not much of a problem. Honey brings it's own healing properties to this type of syrup making it my favorite for sore throats and coughs. Method #3 - For use with herbs that require cooking to activate their healing potential or to deactivate chemical compounds in their make up that might make you sick. Elderberry is one of those plants. See tidbit for more... To make elderberry syrup, you'll need approx. 1 cup of fresh berries or 1/2 cup of dried berries. Boil these in 3 cups of water, then reduce heat and simmer, covered 20-30 minutes. Strain and return to pan. Simmer until reduced by half. Add 1 cup honey to warm juice. Stir well and pour into a glass jar. Cap and refrigerate for up to 6 weeks. Take 1-2 tsps. every 1-2 hours while sick with a cold or flu and 1 tbsp daily as a preventative measure. Additional herbs and spices can be added too...like cloves, cinnamon and fresh ginger. here to purchase dried elderberries or here to buy ready made elderberry syrup. Be sure to check out Melissa'a recipe for elderberry syrup in the linky below. Herbal tidbit - Elderberry is one of the most powerful antiviral (among other things) herbal remedies we know. It's stood the test of time and been shown to boost our immune system, working to protect us during cold and flu season and also to help eliminate viral infections. It's a favorite in my herbal medicine chest. However, elderberries contain a bitter alkaloid and glycoside that may change into cyanide. Cooking the berries for jam or syrup deactivates this process making the berries safe to use. History tells the sad tale of children who used the pithy stems for peashooters and men who used them as maple sap spigots and were poisoned. So, even though ancient herbal experts used the bark, leaves etc. Don't mess with them. My rule of thumb regarding elderberry is don't use the "green" parts. That means no leaves, twigs, bark or roots...at least until I've learned more about them. Leave that up to the medicine men! Herbal Vinegars - these extractions, or tinctures are very similar to those we talked about earlier but with a few additional properties. Vinegar, by nature, brings with it a mildly acidic base that aids in extraction, masks the flavor of more harsh tasting herbs and provides a bit of preservation for your remedy. Herbal vinegars can be used both internally and externally. In many cases, they are useful as gargles and can be added to syrups. Herbal vinegars also make cleansing, yet softening additions to cosmetics and hair rinses. And lastly, depending on the herbs you choose, they make tasty dressings for salads. If you're using vinegar as a daily detox (see more here) herbal vinegars can deliver herbal remedies and/or preventative properties at the same time. Although, when detoxing, the best vinegar to use is raw organic apple cider vinegar, there are lots of vinegars that can be used to create herbal blends. Wine vinegars have a mild taste that enhances herbal flavors with out overpowering them. To make an herbal vinegar, use the cold extraction method just as you would for tinctures. Shrub - A popular drink from the Colonial era started out as a vinegar, was turned into a syrup and then diluted with ice and water to make a very refreshing, non-alcoholic tonic with a bit of "zing" in each glass. The most common flavor, although there are lots of choices, was raspberry. To make raspberry shrub, cover mashed raspberries with vinegar and let stand for 2-3 weeks. Strain out the berries and add equal parts sugar to vinegar, stir until dissolved and simmer 20 minutes. Cool a bit and then bottle and cork. Add 1-2 TBSP of shrub to a glass of ice then top off with water. To give a little effervescence to your shrub, add a pinch of baking soda to the shrub before adding water. I enjoy raspberry but another favorite is ginger shrub. Experiment with your favorite fruits and herbs. Switchel - Another Colonial era beverage popular during the hot, late summer days of haymaking season. Before sports drinks were invented, folks drank this refreshing beverage that was loaded with potassium...an electrolyte. These drinks were made with molasses, a combination of molasses and sugar, maple syrup or honey with added ginger and cider vinegar (here's your chance to add those herbal infused vinegars for an extra punch) and water. Oxymel - a blend of water, vinegar and honey used for medicinal purposes, dating back to the time of Hippocrates. Herbal Wines - This pleasing herbal preparation also brings with it the soothing medicinal benefits of both wine and herbs. There are a couple methods for making herbal wine. Method #1 - as with a tincture, the herbs can be steeped in the wine for about 3-6 weeks, strained and corked. Tonic wines are a good way to extract the medicinal properties of roots. Method #2 - herbs are incorporated into the wine making process along with fruits. Wine making has been going on since nearly the beginning of time. Because wine making is as much an art as it is a science and I have minimal experience, I'm not going to get into specifics. I know a young man who has done a bit of wine making so, Zach, I know you're busy but if you'd like to write more, share a link or comment on this, I'd love to hear from you. Also, my friends at Lady Bug Farm might have some insight to share from their experiences making wine and meade. I'd be glad to hear from them as well. The process involves sugar, water, yeast and whatever fruit, vegetable or plant you want to preserve or extract in this way. Active yeast, as you know, loves to eat sugar. The byproduct is alcohol and carbon dioxide. The more sugar the yeast eats, the higher the alcohol content. I didn't talk about making your own vinegar, although the process is nearly the same as wine making, but I'll share my experience with making my own wine. Each spring, we gather young dandelion flowers to make dandelion wine. After gathering only the dandelion flowers when they are fully open on a sunny day, we begin the rather tedious process of pulling the flower petals from the greens. As the dandelion flowers begin to wilt, they also begin to close. This happens in a short time so by the time we've picked enough, they are starting to wilt. We just grab the entire yellow part of the flower head and pinch off the greens at their base. Any green in the mix will cause an undesirable bitterness and also interfere with the fermentation. You'll need about 3 quarts of blossoms. Boil a gallon of water and pour it over the flowers in a large pot. Cover and steep for 3 days. Peel and juice 2 oranges and 1 lemon. Save the peels and liquid. Add the peels to the flower water and return to a boil. Remove from heat and strain. Add sugar to hot liquid and stir until dissolved. After the mixture has cooled, add the juice from the oranges and lemon, 1 pound of raisins and 1 oz. fresh yeast. Put this mix into a crock with a loose fitting lid. After the mix stops working (a few days to a week), strain the liquid and bottle. Slip a balloon over the top of the bottles to watch for more fermentation. When the balloon has been deflated for a couple days, cork the bottles and store in a cool, dark place for at least 6 months before drinking. If I play my cards right, that means the wine will be ready to open for Thanksgiving! Standard dose is 1oz. daily for medicinal purposes. Or at the first sign of an illness. Read more about The Humble Dandelion. Worty Wine - although the process is the same, wine made with plant leaves is called "Wort" - worty wine might be made with grape leaves, lemon balm or many others. As much as our family likes grape leaves, this is one I'll have to try. Mountain Rose Herbs offers some great infomation about this process and some of the others I've mentioned. If you'd like, you can grab my button from the sidebar to share with others. Just copy and paste the html text onto your site or post to provide a direct link back to The Woodwife's Journal. The Woodwife's Journal was a birthday gift I gave myself last June. It's about my journey as I travel through this year toward the big 50! I set some goals and I haven't met all of them but I wanted it to be a gift not a burden, so I'm good with it. It's my record of the struggle to find myself as I near the point in my life when my present focus will no longer be needed and I'll have to figure out just who I really am. For the past 10 years, I've been quite content to be a wife and homeschooling mom. We've followed our hearts down many a rabbit hole in search of the adventure at the end. I wouldn't trade those times for anything. Just yesterday, I was thinking about how it all began. (Sitting in the house with the shades pulled down because of a migraine makes me melancholy.) All too soon, my girls will both be adults and my place in their lives will change from one of parent and homeschool teacher to that of mother and friend. I wasn't feeling too good about that whole process. Change makes me uncomfortable. I don't like it! As I mentioned on my personal blog, I have/had some dreams and I realized that you can't really trust some people no matter how nice they look on the outside. It's true that you really do find out who your friends are when life takes a turn. But, over the past several months, I've seen the support of some very good friends and that made me feel good about who I am, although I'm still not sure who that really is. The most amazing thing that's happened... one that I never imagined ...EVER...was the loving support that I could find from people I don't even know! As the Journal has grown and I've "met" other folks who share my interests, some of them have reached out to me and made me feel like I really do have something worthwhile to offer. My readership is growing, my pageviews have nearly doubled in the past month. I'm not trying to brag, I'm just awestruck...who would have thought that I'd have so many people, from all over the world, reading what I have to say and coming back for more? Some of them follow me anonymously, some through more public means and in more than one way. It's so...awesome, encouraging, full of good "vibes" as one friend would say! God is so good to me! This past week, as you know, I've been a little behind because I've had a migraine that just wouldn't quit. Yes, I spend the day after it ends in a foggy stupor and the day after that full of rather giddy energy (Ummm...that would be today.) Some of the folks who read what I write sent very encouraging notes to me and I want to tell you how much I appreciate it. So, here's a big "Thank You!" to all of you who have encouraged me with comments, tips, invitations and emails ...it helped me see just how big my God is. Just doing the things I have to do for the past few days because of a persistant migraine. If I can't get this past Monday's Herbal Medicine Chest post out by Wednesday, I'll just wait until next Monday. Sorry for the delay...It's one of those rerouting things I talked about. Although the weather has been beautifully sunny, it's been a bane to me (as are bright computer screens) so I'm hiding out in the dark as much as possible. Due to a few difficulties, today's Herbal Medicine Chest Blog Hop post will be a little late. I'll try to get it up as soon as possible. I just love "warm and natural" batting. I bought a few yards several years ago without even knowing what I would make. Both projects below cost less than $10 each. The pattern was my own design so you could make yours similar or your own idea...short, tall, portly. 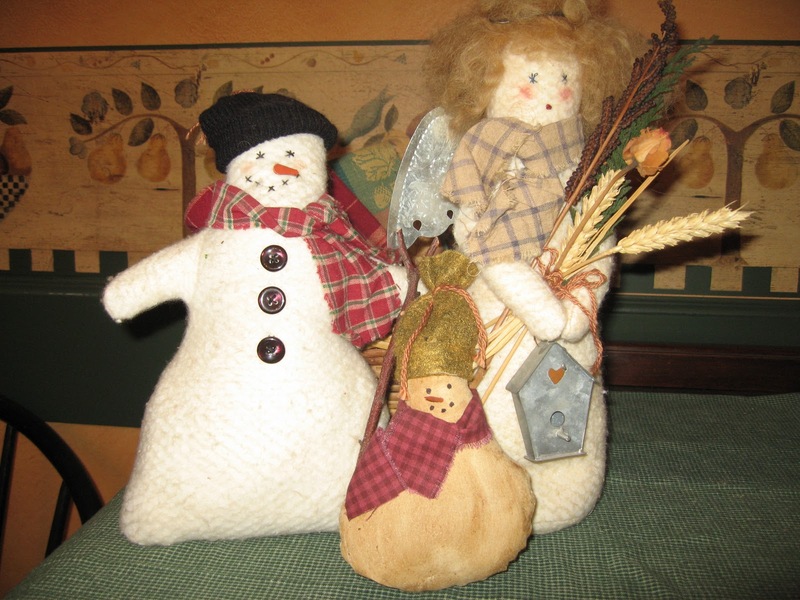 Both the angel and the snowman were made over the same pattern but the trick is that the snowman is sewn across the bottom but the angel has a circular base. For the angel, I used braided wool hair, a silver wire halo, tin punched wings, a little tin birdhouse, a few dried flowers/herbs, and a homespun scarf. Her face is embroidered with starry eyes and a french knot mouth. She could be holding a bag of herbal tea or a tube of bath salts...anything you can think of. The wings could be made from card stock with a punched design instead of tin. The snowman is sporting a hat made from an old sweater/sock, a homespun scarf and recycled buttons. His face is made with starry eyes and the same stitch repeated for the mouth. His nose is a wooden carrot that I carved from a dowel. He could also be the bearer of some small herbal gift. I've made variations on hair color and accessories...all were a hit! Each winter these lovable characters warm my kitchen until the first signs of spring. Makes a nice gift that can be displayed longer than a Christmas decoration. Oh, the little guy in front is made of painted muslin. I met up with a very encouraging gal named Alex who shares a lot of great information on her blog. Last week she reached out to me by featuring my Herbal Medicine Chest blog hop on her site. Thanks for sharing the linky love, Alex! Check it out! 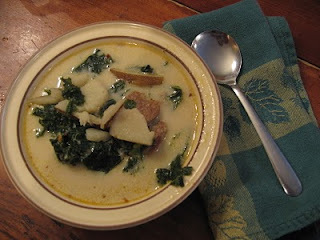 This creamy, yet spicy, Tuscany style Italian soup is wonderful on a cold winter evening to warm you from the inside out. It's easy to whip up and hearty to eat. In a large, deep kettle blend stock and cream over medium heat. Scrub potatoes well and cut, unpeeled, into 1/4 slices. Quarter slices and add to pot. Add chopped kale. This is the reason for the large kettle. The kale will take up a lot of room initially but will eventually wilt into the broth. Grill or sauté the sausage. Then slice about 1/4" thick. Add to pot. I grill it when I can but I also like to sauté it in a little water to encourage the broth to cook out and brown in the pan as the water evaporates. Make sure the sausage is fully cooked. Once you begin slicing, if the sausage doesn't look done, return to the pan. If I have more time, I may return the sliced sauage to the pan to sauté a little longer anyway because it adds more flavor to the soup. Add more water as needed. Remove some broth from the pot and add it to the sausage pan. Gently simmer to release the browned sausage broth from the pan and add it to the pot. Next add spices and gently simmer for 30-40 minutes, stirring occasionally. Delicious served with savory bread or garlic toast. This is the 4th week of our Herbal Medicine Chest. Join us every Monday for the next several weeks to explore herbal preparations and put together your own Herbal Medicine Chest. Share your favorite remedies with the linking tool at the end of each Monday's post. (Now closed to new entries) Don't forget to check the comments section of each week's post to read the remedies shared by savvy folks who aren't blogging. When it comes to intense external application of herbal remedies, it's time to pull out the big guns. Your grandmother probably talked about using some of these in her day. It seems as if they lost some of their popularity in the mid twentieth century in favor of more convenient methods of application but are now regaining recognition as powerful and valuable means to treat many ailments. Here, again, is a group of herbal applications that are rather similar and yet not. I'll share with you my understanding of each and how we use them in our home. Here we'll talk about putting some of the basic preparations we've been making to other uses. See the Herbal Medicine Chest page to connect with the articles in this series that talk about creating those basic preparations or visit the archives for direct links. Compress - a soft piece of cloth, preferably cotton or linen (not synthetic if possible) soaked in herbal tea, infusion, decoction or diluted tinctures applied externally to relieve pain. Cold compresses are often used to ease headaches or applied to new minor bumps and bruises to reduce swelling. Simply soak the cloth pad in room temp or cooler herbal solution of your choice, wring out enough liquid to prevent dripping and apply. When the cold compress warms, soak in cool solution again and repeat. Hot compresses are mainly used to ease muscle pain or speed wound healing. To make these, soak the cloth in a hot infusion or other herbal extract as mentioned. Again wring out enough liquid to prevent dripping and apply. Poultice - a poultice is sort of like a compress except that we're applying the fresh herb itself instead of an herbal extract. Dried herbs or powders can be used by adding a little hot water. The fresh herb needs to be broken down (macerated) by some means to release their valuable properties. Pulse them in the blender, crush them with a wooden mallet, boil them for 2-3 minutes or, my personal favorite, chew them up! Place the macerated herb directly on the skin (you can apply a little oil first to prevent sticking if you wish) and cover with a strip of gauze, a cotton ball or cosmetic cotton pad, muslin or linen to hold it in place. Apply as necessary. The reason chewing them up is my favorite is because it's almost an instant treatment in the field. Chickweed is nearly everywhere is the spring, summer and fall. It's excellent drawing properties make it a good choice for stings and splinters. Self heal kinda speaks for itself. Others in the wild might include sweet violet or plantain. In the garden I reach for lemon balm for insect stings. Don't forget that yarrow has styptic properties that may help stop minor bleeding. Due to the bitter taste, I'd recommend either applying this one directly, like gently pushing the leaf into a nostril for nose bleeds or simply crushing it with your fingers. A word of caution - make sure you know what you're putting in your mouth! If you're not sure, DON'T! Compound Poultice or Plaster - These are very much like poultices except that the plant materials used are dried and possibly powdered herbs mixed with a carrier or medium like oatmeal, ground flaxseed, clay or flour to create a paste when mixed with hot water. Remember grandma's mustard plaster? The hot paste is spread on a piece of cloth and then applied to the affected area. This is covered with another piece of cloth and possibly bound in place by wrapping the area with long strips of cloth. Besides holding the plaster in place for obvious reasons, this also holds in the heat for a bit longer. It may also make this method a little less messy. A word of caution - again, smoothing on a coating of oil may protect the skin from any irritation that might occur from applying some of the stronger herbs directly and ease the removal of the plaster after use (think flour paste). Use caution when applying the hot paste! Test the temp BEFORE you apply it! Another old folk remedy that uses this idea is gathering a little dirt in your hand and spitting in it to make a paste to draw the burn out of insect stings. Of course this was popular when dirt was a lot more "clean" than much of what you'll find now, still, in a pinch, I've used this one on wasp stings until I can get home. For me, it's often all I need to relieve the sting and reduce the welt. Fomentation - fomentation is sort of an old fashioned word used for compress. However in our home, I use the term to differentiate between water or alcohol based applications and hot oil compresses. Using an herbal infused oil and a piece wool or cotton flannel (white is best) a fomentation is made by soaking the cloth pad in the oil until it is saturated. Squeeze out enough oil to eliminate dripping or running and place the pad on the area to be treated. Cover with plastic and then a towel. Oil fomentations work best when they are kept warm. Rather than using hot oil, which could cause burns, the fomentation could be heated with a heating pad or hot water bottle placed over the towel,away from direct contact with the skin. A word of caution - Use caution when heating with an electric heating pad while treating children, elderly or a person who may not be able to feel it if the temp is too hot. Castor oil fomentations are the cannons, the missile launchers, the rockets...get the picture?... in our arsenal of remedies. It's useful in nearly all ailments. So if you're at a loss as to which herbal remedy is best, castor oil can at least bring a little relaxation to the central nervous system which is necessary to initiate healing. Castor oil fomentations are effective in healing muscular and skeletal pain, but the real value is in healing deep pain issues associated with fibroids, adhesions or internal scar tissues, ovarian cysts, congested lymph nodes, infections, inflamed gall bladder, sluggish liver or digestive issues. *Let me insert a note about knowing what you are dealing with before you undertake the treatment of serious health issues. I'm only speaking from my own experience here. Personally, I can't praise them enough. Having dealt with health issues that, aside from the standard present day over use of synthetic hormones, which I refused or unnecessary surgery, my doctors were unable to treat, I turned away from allopathic medicine. When I learned about castor oil fomentations, I was able to use this type of treatment to bring rapid relief. Read more about castor oil fomentations and how to apply them here. The reason we use heat with many of the remedies we're writing about here is to help the skin absorb the healing properties. Heat relaxes the skin and muscles, opens the pores and soothes broken skin. Great news! If all is working properly, you should be able to add to the Herbal Medicine Chest by sharing your favorite Home Remedy recipes. This is a compounding linking tool that we'll be sharing each Monday and I'd love to have you come back to share a new remedy or two, each week. Links can be new or old, but be sure to play fair and leave a link back to this post within it. You might want to let your readers know that you’re participating so they can see all of the recipes posted here as well. It's great way to boost your readership. If you're already blogging, great! Just follow the steps below. But if not, please share you recipe in the comment section. Unfortunately, the comments will need to be viewed with the post where they were originally posted so please, take a look at the additional remedies that have been shared each week. Copy and paste your permalink (direct url) into the form below along with your name and recipe name. I'm ducking as I admit that I'm not a football fan because I know you'll probably throw something at me! But my husband is, so I'm thinking ahead to some munchy snacks to share with the football fans this Sunday. The first to come to mind is my Crispy Flatbread recipe. But it needs something to go with it! Aha! Start with a quart of Homemade Yogurt and turn it into Cream Cheese. Empty a jar of green olives stuffed with pimentos or salad olives into a chopper and mince. Add to cream cheese for a quick and easy dip. Mix together 3 cups of your favorite flour or flour blend* and 1/3 cup of olive oil. 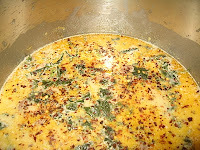 Add to that 1 cup water and 1/2 tsp salt and any other flavorings like herbs or spices. Knead a minimal amount to produce a smooth ball. Roll as thin as possible on an ungreased baking sheet. My baking sheets have ridges that made rolling out difficult so I turn the largest ones over and roll out on the back. Cut the sheet into cracker sized squares with a knife or pizza cutter and prick with a fork to prevent bubbles. You could also use a fluted cutter for this. Bake at 350° for 30 minutes until lightly brown and crisp. I usually have to remove the outer edge and return the rest to the oven for another 3-5 minutes. That may be because I'm baking on the back of the sheets and there aren't any edges to defer the higher heat when the oven comes on to maintain temp. *The sky's the limit when choosing a flour blend. unbleached flour and dried black beans - these are wonderful with salsa. You might need to add a tiny bit more water and oil to the whole grain or bean blends because they absorb so much. But remember not to overwork the dough. Have fun experimenting. If you come up with a tasty combination, please come back and share it in the comment section.